For Bill and Jennifer LaPlant, 24 hours in one day just doesn’t seem enough. While Bill operates LaPlant’s Lawn & Property Maintenance — mowing, trimming, snow plowing and maintaining more than 100 commercial and residential properties — Jennifer runs the couple’s garden center and greenhouse business in Lyons, NY, where they sell numerous varieties of plants, hanging baskets, bark mulch, gifts, local products and garden supplies. Empty nesters, the couple devotes their energy to the businesses but without reliable labor, it’s been tough lately. Bill LaPlant said the busiest periods, April through June and October, students who could work seasonal jobs are still in school. Few others want to work outdoors in all weather. Since 1991, Bill had plowed snow and did landscaping as side income jobs. By the time he went full time, he had drummed up enough business to keep quite busy. 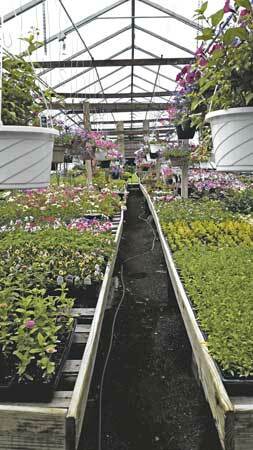 In 2007, the couple started the greenhouse business as a retirement business for Bill’s stepfather, Wayne Morey. Morey discovered he didn’t care for growing plants much, so Bill took it over again. About four years ago, Jennifer joined the business. Morey helps out now and then, especially with equipment repairs. Jennifer starts about 100,000 seeds a year in the 2,000-square foot greenhouse they operate at their home in Williamson, NY. The display greenhouses cover about 6,000 square feet. “We do get cuttings from a broker, Barone Gardens in Cicero, because you can’t get seeds for some of this stuff,” Bill said. This year, the LaPlants added trees and ornamental bushes, sourced from local vendors when possible. The LaPlants primarily advertise through postings on Facebook and word-of-mouth. “I don’t advertise the landscaping portion of the business at all because I’m booked for the whole summer,” Bill said. With Jennifer now running the store, he doesn’t have her help as much for mowing. She also used to help with the snow plowing. However, they decided she should focus more on the store so they cut back on the number of properties they maintain. It’s a feast-or-famine type of business, so hiring help is difficult. Jennifer shines in her role in the store, greeting customers with a smile, suggesting the plants that would fit their needs and answering questions. Bill wants to add koi ponds to the business to help provide fertilizer for plants and function as a display pond to show customers his talents. They hope to eventually open the store year-round, including Christmas trees, coal and wood pellets and ice melting agents. To do so, Bill said he wants to improve the store’s infrastructure. One big step would include installing water lines. At present, the LaPlants pump water from Morey’s house to fill a tank for watering plants. They’ll also need more indoor space to store the merchandise. As they continue to flesh out the business, Bill wants to stay true to its core values.